Sherlock Holmes: Crimes & Punishments is ranked in the 66th percentile of games scored on OpenCritic. Sherlock Holmes: Crimes and Punishments is a member of an unsung breed of games: the kind that rewards critical thinking and judgement over twitchy reflexes, strategy, or putting the right pegs in the right holes. Overall Sherlock Holmes: Crimes and Punishments is a fitting title and if it weren't plagued with various problems like load times it would have been an even better title. It is a great crime thriller and if you are into that sort of game I would certainly recommend picking it up. This is clearly a game made by Holmes fans, for Holmes fans (although you don't have to have read the stories to enjoy it). Hopefully the game doesn't get lose in the holiday game release madness, because it would be great to see follow-up titles building upon all that this game does right. Overall, Sherlock Holmes: Crimes and Punishment made an excellent addition to the Holmes Adventure games. The new modern approach really benefits the game as a whole, and the new engine brings out the best in the Holmes games that the others just couldn't convey. I would highly recommend this game to anybody who enjoys the Sherlock Holmes universe as well as to anyone who enjoys detective/mystery games as well. Sherlock Holmes: Crimes and Punishments is more than just an excellent detective adventure, it also absolutely nails the essence of being the pride of Baker Street and in doing so provides an exciting roadmap for where Ukrainian developer Frogwares will take the series next. Sherlock Holmes: Crimes and Punishment isn't anything groundbreaking, but it's probably one of the best narrative-focused mystery games on the market. It's definitely a polished experience and may very well be the best Sherlock Holmes video game ever created, with a tense atmosphere, satisfying cases, and varied mini-games and puzzles. I realize that it's going to be hard to fit in yet another game into your hectic fall release schedule, but at least Sherlock Holmes: Crimes & Punishments can be broken up into manageable chunks in between your other gaming sessions. If you're a fan of Sherlock Holmes or mysteries in general, I can't recommend this one enough. I absolutely loved diving into the mind of Sherlock Holmes while playing this title. People who have read, watched, or played anything else from his world will no doubt find something familiar and enjoyable in Sherlock Holmes: Crimes & Punishments. My time as Holmes was extremely exciting, fun, and immersive, and I was impressed with how long it lasted. Every case had some new gameplay element introduced, like getting to play as Holmes' hound Toby to follow a scent trail. Each character was beautiful in detail, but not in animation, and each case elegantly came to an end while Holmes' life went on to the next one, and I was happy to be a part of each and every moment. That said, we thoroughly enjoyed our time with Sherlock Holmes Crimes and Punishments, which is our favourite game starring the drug-addled sleuth so far. From the crisp and detailed graphics to the huge variety in gameplay, this is a solid puzzling adventure that will please anyone after a good yarn. A cracking adventure game, possibly the best Sherlock Holmes game that Frogwares have given us thus far, Sherlock Holmes: Crimes and Punishments goes a long way to making players feel like we are are Holmes rather than simply playing a game about him. There are little niggles here and there, but frankly if you enjoy your detective mystery games, it would be criminal to overlook one of the best we've had in ages. What we have here is the first, full-on, legitimate mystery game for the current generation. It would be easy to give Crimes & Punishments the typical "for fans of the genre" recommendation, but I think it aspires to and accomplishes more than that. Sure, it has some rough edges, and not every case is a home run, but the Deduction system makes it all worthwhile. Crimes and Punishments is a great adventure game that's unfortunately plagued with iffy clues, an unrealized morality system, and puzzles that that get a bit repetitive. Sherlock Holmes: Crimes & Punishments is an enjoyable collection of different cases putting you once again in the shoes of the one man that can solve them all. The synapse style deduction board is a giant leap forward for the series, allowing you to finish cases with inaccurate information. I did end up sentencing an innocent man to death, but the game does allow you to go back and adjust your conclusions before proceeding to the next case. Fun puzzles, inventive murders, and new crime-solving features help make up for a morality system that needed far more fleshing out to be effective. Overall I enjoyed Crimes And Punishments as it managed to include many of the important features a detective game should have. Being able to punish the wrong people, and getting cases wrong is something that should be in all detective/crime games, but surprisingly most a very linear in that regard. The gameplay also features a nice variety of activities so it doesn't become too repetitive. If you are a fan of nonstop action games then give this game a miss, but if you like a slower paced game were you have to think and explore then this is the perfect game for you. All six cases are interesting and brilliantly written, filled with characters that not only fill a role, but perform exactly as you'd expect from the Sherlock tales of old. The developers have wisely avoided pigeonholing the game's moral code into black and white (again fitting in with the original Sherlock character, who was hardly a saint), and it these shades of gray to explore that makes each case as well as the interplay between Sherlock and Watson so interesting. Sherlock's mind is presented in such a way that he is clearly a man treading the line between madness and brilliance, which makes this opportunity to play him all the more riveting and an opportunity not to be missed people who enjoy genuine detective fiction. Crimes and Punishments is a game that is otherwise fantastic in nearly every aspect it devotes its time to. It's a game that reminds us of how great Sherlock Holmes is, and why the character has endured for so long. But it's also one that reminds us why Conan Doyle wanted to abandon the character. You can't escape him. He'll always decipher the clues, always find you, always see through the most perfectly planned murder. He marches ever onward, against the flow of time, holding on steadily. He'll always be there, Watson in tow, ready to take the next case. And God help us, there's still some appeal in that. Sherlock Holmes: Crimes and Punishments delivers a good system for finding clues and solving murders with a complex clues and deductions system, plenty of puzzles to be had, and good mysteries to boot. The gameplay can be a bit repetitive at times, however if your willing to overlook that, it can turn into quite a mystery game. The visuals and art are sure to impress, and you can expect hours of content from this title, all with a unique moral system to track how you compare to others who play the game. Underneath some flaws and clunky controls, there's a very strong Sherlock Holmes game present in Crimes and Punishments. Those who can look past the issues will find enjoyable deduction based gameplay, but for others the problems might outweigh the strengths. With clever puzzles and a dash of modern sensibilities inspired by the BBC show, Crimes and Punishments is an easy recommendation to armchair detectives - and the first to let players really experience being Sherlock Holmes. Sherlock Holmes: Crimes and Punishments is the greatest detective experience in the gaming today. As a game though, it's fairly rough around the edges. Interesting game play mechanics and strong cases will make this a must play for any fan of Holmes, mysteries, or point and clicks. If none of those strike your fancy, this game is not for you. This latest puzzling offering is more than elementary then, we'd say. Multiple cases presented well (ignoring the loading issues) all with a variety of possible outcomes which can be achieved using various tools and the power of your own deduction. You do get to feel like Holmes if we're honest; searching for the evidence, logical reasoning and grand espousing - it's very Conan Doyle. The fact it can all be played in bursts or short sessions given we're looking at discrete cases, and the way the game gives feedback on your choices compared to the reality of the situation - and compared to other gamers - adds to the experience the same way similar feedback does in many interactive novel games around at the moment. Ultimately Sherlock's alright - not much more, but alright might be all you need in the quiet autumn evenings. Over the last decade, Frogwares has been steadily eliminating the impossibly bad elements from their games, and what remains is the closest anyone's ever come to an authentic Baker Street experience. 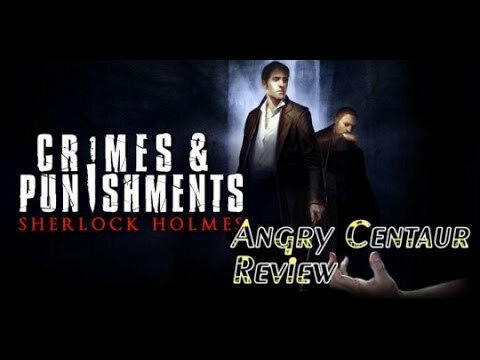 Sherlock Holmes: Crimes And Punishments is a perfect example of only being able to recommend something to either fans of the source material or of the genre of games. It's neither amazing nor terrible, but will satisfy anyone interested. There is no doubt that Sherlock Holmes: Crimes & Punishments will be a sleeper hit and will find its audience, but for anyone who would enjoy a procedural crime investigating game, this title comes highly recommended. By far one of the more interesting adventure games to have come out in years. While an excellent step in the right direction and a guaranteed hit among fans, the layperson may find too many faults to enjoy the experience extensively. Crimes & Punishments is one of the better, if not the best, Sherlock games out there, and if that's not saying much to you, it's also one of the better investigation-style games. The balance and variation of gameplay should be applauded. The developers are definitely onto something here. Overall Crimes and Punishments serves as a deliberate, well put together mystery game. It serves as a great change of pace from the shooters and action fodder out there now and that will undoubtedly follow in the coming months. Unfortunately, lack of a cohesive story, feeling of being on a set, and the overall vapid nature of those sets lead the game to a somewhat boring end. Despite the nagging feeling that the game's mechanics are held up by a certain amount of smoke and mirrors, there's more than enough substance here to hold your attention for the fifteen to eighteen hours it takes to finish the game.